For those of you that read Are You Charlie? regularly, you are probably wondering what this post is doing in between photos of sweaty musicians, songs about catching lifts and videos of rock stars in epic battles between their good and bad sides. This, my friends, is what I study. I have to gloat when I think that while some people crunch numbers and mull over legal cases, I get to make documentaries, read beautiful literature and poetry and publish my assignments on my blog. This assignment is for my digital journalism class. We had to take a current news event and put together a plan for a content package. The point isn't to actually put the package together, it's to come with the strategy to do so. This might interest some of you, and others not so much. Either way, if you have any suggestions of things to add, let me know. You can share the credit, I promise. It was reported last week that President Jacob Zuma's homestead in Nkandla was being upgraded at a cost of between R203 million and R238 million, with taxpayers having to foot a large portion of the bill. Public Works Minister Thulas Nxesi, whose department is responsible for the upgrade, defended it, arguing that the ministerial handbook on spending of public funds does not apply to the president. This week, The Mercury revealed that Nkandla has also benefited from a road construction worth R582 million, which taxpayers will also be paying for. This would serve as the anchor text from which the rest of the strategy will unfold. The in-depth article, which is not limited by space, will include links to other articles or media on the subject. This is so that the reader can conveniently refer to additional information that is related to the news item, thereby generating more traffic onto the website. The article, however, should not be text-laden, as this puts readers off reading the entire piece. It should make use of lists, subheadings, graphics and videos in order to command the reader's attention. Readers have the option of forwarding the article to their friends, or to share a link to it on Twitter or Facebook.This, again, increases traffic to the site. They can also comment on a news story, which sparks debate and gets people talking about the news item. By doing this, readers become more interactive with the news, and are able to exercise control over what they consume. In this way, readers have gone from being passive receivers of news to active consumers, which makes it all the more important to build a reliable brand that they will come back to. The Mercury broke the story of Nkandla also benefiting from road construction development at the taxpayer's cost [Source]. 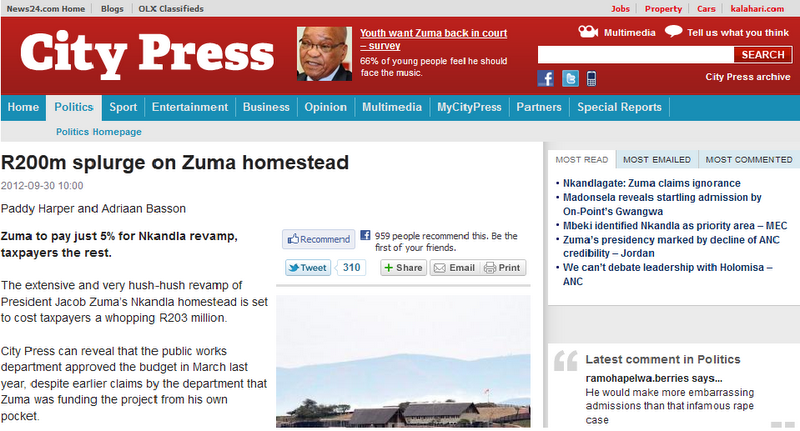 City Press breaking the news of the cost of President Jacob Zuma's homestead. Readers can tweet about the article, recommend it on Facebook, share it on their site, or email it. [Source]. The Guardian's article on Angela Merkel's visit to Greece. It includes a video of the protests against her visit right at the beginning of the article [Source]. This is done by experts or thought leaders concerning the news item. Articles such as this will generate a lot of traffic for the website as the person's opinion is valued and respected. This helps strengthen the brand and will also increase traffic to the website. It provides an in-depth understanding of an issue, whereas a hard news article merely provides the facts. Articles such as this also spark debate, which is vital in building a relationship with readers. It can also include links to the anchor article and other media on the subject. A column by Pierre de Vos on the issue in City Press. Next to it is a cartoon, which makes use of different types of graphics [Source]. One of many pieces that comment on Angela Merkel's visit to Greece on The Guardian's website [Source]. Times column by Justice Malala. There is the option for readers to view a small gallery of pictures [Source]. Links to articles on the subject should be tweeted from the publication's Twitter account. This should be done in a brief, yet enticing way so that readers will click on it. A hashtag should be created for the story. This could be, for example, #nkandlagate or #zumaville. This categorizes tweets, and so will make them easier to find and follow by people who are interested in the subject. Using a hashtag is also beneficial in that you can see what other publications, as well as other Twitter users, are tweeting about the story. 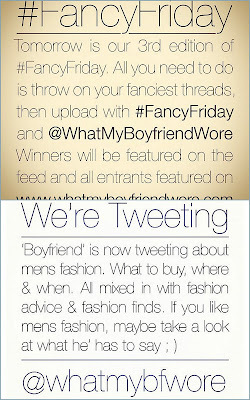 Twitter users can also retweet the link to the story, thus increasing traffic to the website. It can also be used to build anticipation for a story that will be released the following day. Twitter is an extraordinary tool that can be used to build a social brand that is accessible and well-connected as it allows you to interact with consumers of news in real-time. They can comment right there and then, which sparks debate between different people from all over the world and can also be used as a way to test public opinion on the upgrade of Nkandla. Connecting with the audience on this level also makes you more aware of what people want and what they don't want in terms of news content, based on their reactions to the story and how many times the story gets retweeted. Tweet illustrating the use of Twitter to build anticipation for a forthcoming story, and the response to it. Tweet illustrating the use of a hashtag. Tweet illustrating how Twitter can be used to interact with the audience. Tweet illustrating the link to an article. Facebook is another social media platform that can be used to illicit a large response from an audience. A link to the anchor article should be provided on the publication's Facebook page. Readers can comment on the link, or share it with their friends if they like. A group which discussed the issue of Nkandla's upgrade can be created so that people who feel strongly about the topic can engage with one another in discussion and debate. Facebook also provides the opportunity to upload photo albums which can provide more of a visual aspect, as well as more context for a story. 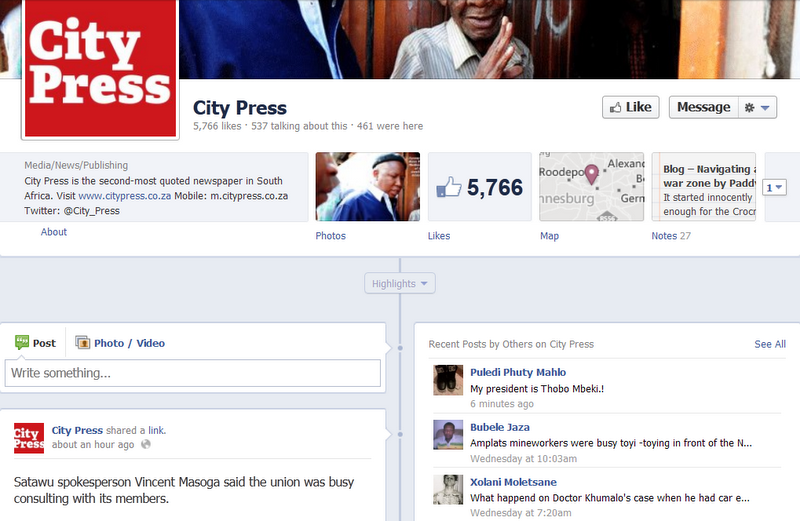 City Press's Facebook page, where links to articles are posted. 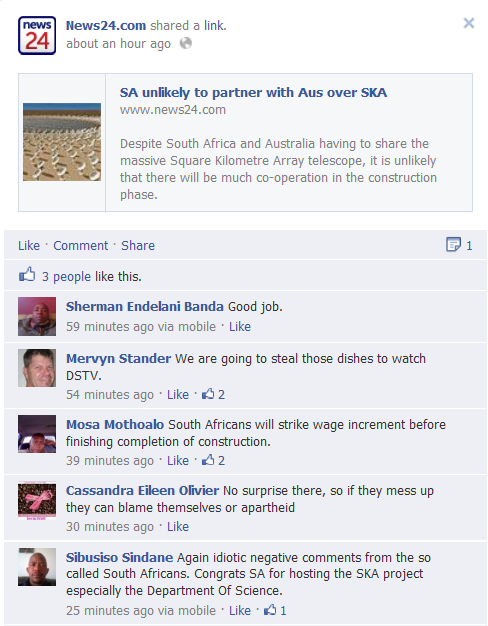 News24's Facebook page, illustrating how readers can share their opinions and interact with one another, also sometimes what they have to say can be a bit worrying. A number of multimedia strategies can be put in place. The use of multimedia is vital as it provides the audience with a multi-sensorial experience of the news. It is user-friendly and can also be interactive should the audience choose to comment on it. People are more likely to engage in multimedia than text-laden articles as it provides a different, more interesting way of understanding information. It also a better way of the audience to retaining whatever information is being conveyed and, most of all, it is enjoyable. Multimedia has broken the barriers of storytelling as it broadens the scope of what can be available in print. Excellent example of a story that uses different forms of multimedia by the Globe and Mail. This section will be broken down into a number of smaller ones. Because Nkandlagate isn't a story where action is unfolding in real-time, videos cannot be used in the traditional sense of showing the audience what is happening on the ground. Videos can be used, however, to create a way of telling the story in the form of a short TV bulletin. A video could also be used to document vox pops. 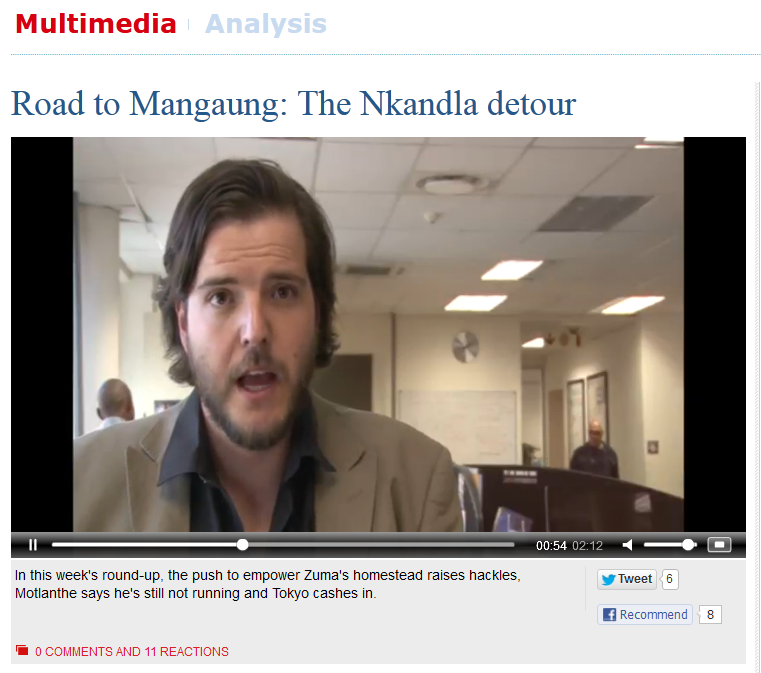 Mail & Guardian have a TV bulletin-like analysis of current events [Source]. Interactive diagrams are an excellent way of trying to make sense of a story that has many layers to it. They have that visual aspect to them that attracts the audience but also make use of text in order to provide context. Cartoons are a tongue-in-cheek look at current events. They are able to capture what is happening in the news with just a few words. Depending on the nature of the cartoon, it might be difficult to establish context if you are not aware of the full story. For this reason, it is essential to embed the cartoon between text, or make it part of a content package so that that context can be established. The presence of something visual immediately attract the reader's attention in amongst a lot of text. Cartoons are often controversial, which allows for discussion and debate on the topic. Cartoonists such as Zapiro have great following, automatically directing a large audience to a website. Cartoon by Peter Brooks of The Times [Source]. Cartoon by Zapiro in The Times [Source]. Souncloud is a social audio-sharing service that allows for radio-style journalism and commentary with a twist. It allows print publications to make use of traditional radio content and can be used to increase traffic to a website as it grabs the listener's attention. In the case of Nkandlagate, it can be used to broadcast interviews with key figures involved in the story, like Minister of Public Works Thulas Nxesi. It can also be used to gather vox pops on the topic, which would be a way of including the audience in the storytelling process once again. Columbia University's Chief Digital Officer, Sree Sreenivasan, uses Soundcloud to publish interviews. Instagram is tricky as it doesn't encode URLs dropped in common threads. The photo-sharing service, however, can be used to build a publication's brand and engage with the audience on yet another platform. 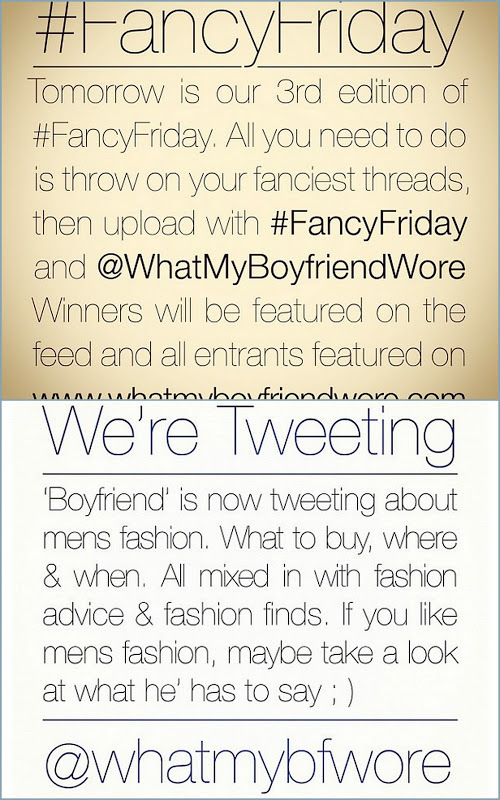 This can be done by Instagramming screen shots that pose questions that users can answer, or to promote an event. It is yet another tool to communicate with your audience. Google + Hangout is a group video chat feature. It can be used in the case of Nkandlagate to create a forum of discussion which would include reporters, experts and the audience engaging in discussion about the story. It is an innovative way of combining the benefits of broadcast with the social web and, most importantly, it allows for viewer participation. Environmentguardian.co.uk editor Adam Vaughan hosted a Google Hangout with followers of the Guardian on Google+ to discuss fracking in the UK and its impact on the environment. Storify allows journalists to curate content from various social media platforms in a clear, logical way, while connecting it all with reporting in between that provides context and perspective. It also allows for the audience to get involved in the storytelling process and is especially unique as it allows for an abundance of opinion. The service also lets people know when their tweets are being used. This helps people feel rewarded for contributing to the news, and it also helps spread the story. With the Nkandlagate story, Storify can be used to ask the audience questions about the story and then to capture the best reactions. Another way that Storify could be used, would be to capture a debate between two prominent individuals on the topic. Ideally, live blogging would be used to chronicle live events for a specific period, providing the audience with real-time content. Information can be shared and distributed through a variety of tools and resources like photo sharing, social media, video blogs etc. 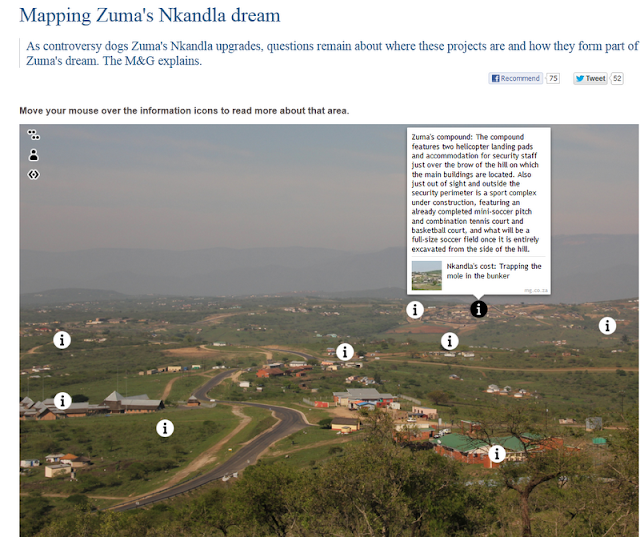 In the case of Nkandlagate, where live events are not occuring, live blogging can be used to discuss the story and still make use of all the above-mentioned tools in order to share information. This allows for the ever-important audience participation once again. That's all, folks. If, by some slight chance, you made your way to the end of this (and your name is not Chris Roper) and you have anything you would like to add, let me know.